Toilet Repair, FishHawk, FL | A Step Above Plumbing Inc. Toilet Repair, FishHawk, FL | A Step Above Plumbing Inc.
For all of your toilet repair and plumbing needs in and around FishHawk, Florida, let our team help you today! Toilet repair comes in many types and functions. With a large number of different models on the market, knowing what fixture sits in your bathroom is essential to identifying what the problem is and if it requires professional assistance in order to correct it. First, identification of the problem requiring toilet repair can be simplified into two branches. Is water flowing, or is it not? If water is flowing, is it leaking from some point or going where it is not designed? This can be due to an issue with the flush valve or to an imperfection or crack in the toilet. The flush valve in most toilets is either a tapered float ball or a flapper ball, which lifts when the handle is pulled in order to allow the tank to flush through the bowl and down the drain. If this is not sealing properly or if the flush valve is defective or damaged, water can continue to move through this valve, and your toilet will continue to ‘run’. The opposite problem is when the water is not flowing. On occasion, the flush valve becomes disconnected from the handle or trigger mechanism, and re-attaching the chain or other connection allows the toilet to work properly again. The fill valve can be known by many names, including a float ball, plunger fill valve, diaphragm type fill valve, or other names. These respond to rising water levels in the tank by eventually moving a control arm to shut off the flow of water to the tank. 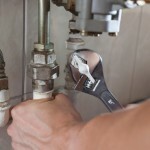 Damage or malfunction to the arm or the fill valve can cause the issue of a toilet seeming to run forever. If this valve is set too high, water can continually spill into the overflow pipe. Certain clogs can also cause water to stop up, and resolving this problem depends largely on where blockage occurs. For all of your toilet repair and plumbing needs in and around FishHawk, Florida, let our team at A Step Above Plumbing help you today!